Aiseesoft iPod touch ePub Transfer can transfer eBook files-ePub to iPod touch directly without iTunes or any other application for you to easily enjoy eBook on your iPod, iPhone, iPad. You can transfer any ePub files from your computer to iPod touch. It can copy iPod touch ePub files to computer for backup or sharing with the original quality. Also can help you easily detect ePub files by the search function in the category of Genre, Album. Copy iPod touch ePub files to computer for backup or sharing without any losses. ...... This iPod touch ePub Transfer can help you easily detect ePub files by the search function in the category of Genre, Artist and Album. You can directly transfer ePub files to iPod touch without iTunes. This iPod touch ePub Transfer can help you enjoy ePub on iPad, iPhone, iPod touch. Transfer music/Video between ipod and computer. Qweas is providing links to Aiseesoft iPod touch ePub Transfer 6.1.28 as a courtesy, and makes no representations regarding Aiseesoft iPod touch ePub Transfer or any other applications or any information related thereto. Any questions, complaints or claims regarding this application Aiseesoft iPod touch ePub Transfer 6.1.28 must be directed to the appropriate software vendor. 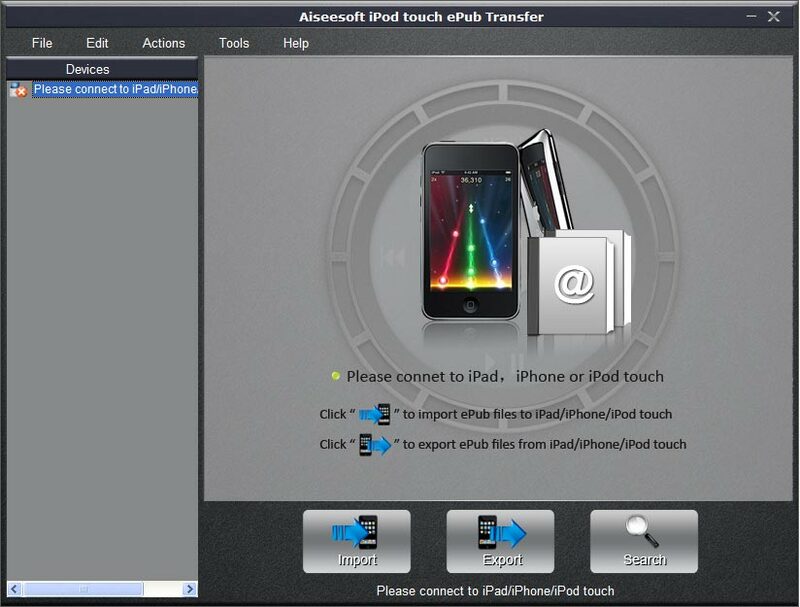 You may click the publisher link of Aiseesoft iPod touch ePub Transfer on the top of this page to get more details about the vendor.